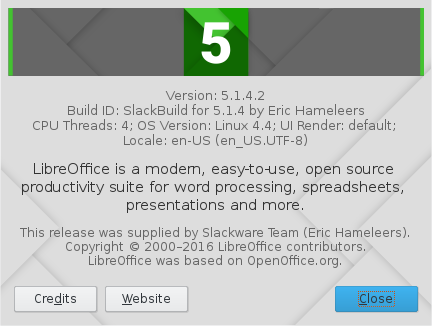 The Document Foundation released Libreoffice 5.1.4 on June 23, but I was kept busy with preparing my own packaging and scripting stuff for the release of Slackware 14.2. In addition, a new release of Plasma (5.7) is near, for which I promised a Live ISO to be available on July 5. Still, I thought new packages were needed after someone pointed out that there is a CVE associated with the 5.1.4 release because it fixes a security bug: CVE-2016-4324. Therefore I am pleased to announce the immediate availability of Slackware (14.2 and -current) packages for LibreOffice 5.1.4. According to the announcement this LO release is “targeted at individual users and enterprise deployments. Users of previous LibreOffice releases should start planning the update to the new version“. LibreOffice 5.1.4 is otherwise a minor update, focusing on bug fixes. Posted: 3 July, 2016 in Slackware, Software. Have been using calc for a work project. Works fine, looks good, results are compatible with Office 2010. Thanks Eric! Now take a good, long, holiday! When building with 14.2 is the requirement to removepkg glew still valid? John, I do not removepkg glew anymore. Thanks for keeping us up-to-date with LO. thanks for packages. However I found a problem with dictionary for pl_PL. It seems that libre cannot find it. Hi Pawel, the dictionary package “pl” is present in the package directory, if you install that, you are unable to use it? gorson if your question is not about LibreOffice why are you posting here? There’s plenty of other more to-the-point articles where you could have asked this, including the all-too-obvious “Your Feedback” page of this blog. Also your question is a generic Slackware question, not related to any of the “3rd party” stuff that I make available for Slackware (please note that there is no such thing as a “slackware 15”) so I think that your question is more suited for the Slackware forum on linuxquestion.org. Many thanks Eric! Great job! A little drawback: the video inserted into the impress presentation plays full-screen regardless of anything. Can you please check the issue? Andrey, I would not know what to look into. Mind you: I package programs so you can use them, but I do not develop them. Perhaps a good idea to create a bug report in the LibreOffice bug database? I’ve installed 3 packages (main, l10n, dict-pl). And spellchecker does not work. However, I just realized that it all looks quite strange. Language for document is set (can I trust L-O?). But in pop-up window (spellchecker) combobox for that information is void. Dear Eric, I scanned through the LO bug report for LO Impress and separately for LO Media Player and found no other reports neither from Linux nor Windows users in concern of forced full-screen play. Do you think is it wise to check the build log for the issues in concern of LO Media Player or binding with GStreamer? and if so will you? 1. The full-screen play, I found out, is actually scaled to window size of the program. 2. The “View” field in the LO Media Player is empty and greyed (disabled). My guess this field is responsible for the play mode, but somehow LO Media Player picks up the size of host window instead of the preset size. Hi Andrey, if you think this issue is related to the version of gstreamer used for LO (the 1.0.x instead of 0.10.x) then that is worth mentioning in a bug report. Ideally both versions of gstreamer should work and since gstreamer 1.0.x is a lot newer, it makes sense to use that by default. If that choice breaks the embedded multiledia support, it is certainly something to be fixed by the LO developers or at least have them issue a statement about it. If they reply with “if you want a working embedded multimedia support in Impress you need to use gstreamer 0.10” then I may decide to make that the default during compilation. PS the build logs show no issues, this is a runtime thing, not a build-time thing you are experiencing. I have recently reinstalled a system and installed libreoffice from scratch and I noticed that libreoffice-mozplugin is not avalable anymore. Probably you have explained about it in the past so my apology for bringing it up now, but is it replaced by anything else? gone for good? still fine to use the last version that was available with LO 4.x ? I will add the info to the main article, because you are the third person since 4.4.0 who is asking about it. I’ve checked LO on 3 devices and -surprise- on 2 of them installed packages worked very well. On 3rd – not. Despite the fact, that system on all of the computers are almost the same (brand new slackware 14.2, only /home mounted from old 14.1). But now it is meaningless since new packages with LO 5.2 seem to work well. Thank you.